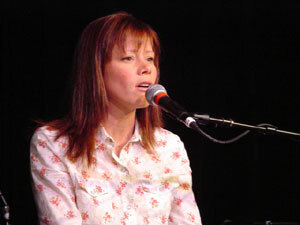 30-CC talked with Sara Groves during the singer's Green Bay tour stop. What follows are a few excerpts. 30-CC: Your current CD is called "The Other Side of Something." Where did that title come from? Sara: It documents a spiritual shakedown of my faith over the last three years. I feel like I'm on the other side of it. . .I can't quite put my finger on it. . .(but) I've definitely come out of the other side of it and am feeling stronger and more peaceful now. 30-CC: What can listeners expect from your new CD? Sara: This album is our first movie. . .its a lot like the music I like to listen to. Its very introspective. My whole life is used in the album, my marriage, my boys, my spiritual walk. . . .
30-CC: Your CD received a five-star review from Christianity Today dot-com. What do such accolades mean to you? Sara: It's a tremendous honor. I have to walk out of the studio and say 'I'm proud of what we did' regardless of how the reviews go. . . . Its like your children. You want your children to be well-liked and so it is a tremendous honor that that's thrown on top. 30-CC airs throughout Wisconsin and Dubuque, IA and Rockford, IL on public access cable channels.